On January 13, 2015, the Holy and Sacred Synod of the Ecumenical Patriarchate in Constantinople officially entered PAISIOS EZNEPIDIS (1924-1994) among the list of saints whose memory the Orthodox Church celebrates. To begin with, since I never imagined that a time would come when I would narrate Father Paisios’ life―and he himself never related his life all the way through―there may be some gaps regarding dates and events. Only out of gratitude towards the Elder did I accept to come here Mr Nikolaidis, to this television station, so as to give my own testimony about his holy life, his presence within Orthodoxy, within our Church, about all the things I saw during my stay on Mount Athos, and everything else trustworthy people have told me. These are the things I will talk about, feeling, of course, that narrating the lives of holy people is an extremely difficult task. It is particularly difficult because the Elder was truly a holy person, and we are nothing and have understood very few things. Let us at least hope that God help us relay the facts as we witnessed them and the people that are listening to evaluate them according to their own disposition. I met Father Paisios in 1976, in September. I visited Mount Athos for the first time, and there, together with the rest of my classmates, we visited the Elder, when he resided in his small hut at Timios Stavros (Holy Cross), near Stavronikita Monastery. I met him there. I must say, we arrived curious to see the Elder, about whom we had heard so much. He received us with much love, and I must say that our first meeting disappointed me a little in the beginning because I was not familiar with the secrets of these spiritual people. When I saw the Elder, who received us in such simplicity, he gave us various treats and told us jokes and laughed. I started to doubt that this man was truly as much a saint as he was considered, because I thought saints were meant to be silent, not talkative and glum. I was under this impression. But afterwards, the truth refuted us, as the elder spoke of things we had never heard of before, and he had his own life as a testimony. The first incident which I testify to in all honesty, is that when we were greeting him goodbye and kissed his hand, something happened that truly was God’s intervention. All the mountains, all the surrounding atmosphere overflowed with an indescribable fragrance. The whole area smelt fragrant. The Elder realized this and immediately recommended that we get on our way, while he headed towards his cell. We, the three kids that we were, set off for Karyes without perceiving what was happening, feeling an indescribable joy inside, which had no a explanation. We neither understood the reason we were running, nor the reason the surrounding mountains, air, rocks, and everything smelt sweet. What I experienced the first time I met Father Paisios was moving. “Arsenios, I am the Resurrection and the Life. The one who believes in Me will live even if he dies.” This experience of Christ’s appearance was―as far as I know―the first of young Arsenios’ in the sphere of supernatural revelations and possibly, the most decisive sign of his later path of monasticism. The elder carefully avoided any talk around his name, and I can say that the only times he used to become strict―so much so that one would feel afraid―were when someone talked about him, recalled or mentioned miraculous incidents relating to him. When I visited him in 1976, I said. “Elder, you have a great reputation out in the world*; people think well of you, well of your name.” He replied laughing, as he usually said in jokes and in a very cheerful and wise manner: “Now when you were coming from below, did you pass by the garbage dump?” (the one in Karyes). I said: “I did…”. “There in the garbage dump of Karyes there are quite a few squid tins. And there, when the sun falls over them, they shine. That’s what has happened to people. They see the sun shining off the tin, which is me, they think it’s gold. But, my child, if you approach close, you see it’s a squid tin.” He said this, having fun with it. He was a man whose greatest work was prayer. Only later on did he dedicate himself to people. Despite all his hardships, his ordeals, he was a fleshless man: a man that did not know sleep or rest. He was always in a good mood, and he always retained love in his heart to receive people’s pain. I remember during Christmas of 1981, I went to visit him after Christmas vigil. We talked, and he explained to me what a great thing God’s love is. He used to say that God’s love resides in man like fire. He told me: “A few years ago this love burned so intensely inside me that my bones were melting like candles. And in fact, once, so much Grace fell on me that as I was walking, I knelt and could not continue. I was also afraid that someone would see me and not understand what was happening to me.” Eight years later, this great love turned without abandoning him, of course, into a great pain for people. It seems that from then on, the Elder dedicated himself to people in distress, after having been made God’s habitation. Father Paisios was visited by people of all classes: educated and uneducated, bishops and many professors, even people of other faiths and every type of person. In general, the places he lived cannot be described: The Cell of the Holy Cross was such a remote cell that I recall, as far as the eye could see all around, we did not see any other monk’s cell. Desert. I recall the Elder used to say to me: “If you hear any sort of noise during the night, do not be afraid. It’s wild boars and jackals”. And despite his illnesses, he would never neglect his duties. It is amazing that up until complete exhaustion he continued his fight. I recall we attended a vigil in the monastery for Christmas, which lasted approximately ten hours. The Elder received people all day and did not rest at all. All night during vigil he was standing. I sat right next to him and waited to see when he would sit. He did not sit at all all night; he remained standing. At some point he said to me: “Why don’t you move a little further over? Are you a policeman?” He understood that I stood next to him to examine what he would do. His love was infinitely and richly evident to everyone who visited him, especially to those in distress and to the youth. I remember something I experienced vividly in 1982, when a youth visited Mount Athos from Athens, who was a modern young man, with a most inquiring mind, muddled in a lot of difficult things, disappointed from his life and his environment, in dirty clothes―a state that attested to his disorder and concerns. The youth visited Father Paisios. They spoke and then he left. After two or three months, he returned and crying told me the following. In Athens, when he experienced various bad mishaps and this melancholy caught hold of him, this depression, he got on his motorcycle so as to commit suicide. Speeding he said: “There is no one in the world, nobody loves me, [no one’s] interested, better to kill myself and end my life”. It was an old rag, which was used to place saddles on mules. He also had a small stool where he used to sit and pray, a piece of wood he placed on his knees and wrote on, a hole with a few sheets of paper and a couple of pencils with which he wrote. Father Paisios was extremely poor. He owned nothing. Many people left money for him. They hid it so that he would find it later. But when the Elder used to find money, he usually placed it in books or magazines and gave it away. He was so poor that once, I remember he told me he didn’t even have 500 drachmas to buy bread. He did not have a mini gas stove; he did not have any cooking pans. He only had a couple of tin cans, where he used to throw tea or boil rice inside. He also had a small pot which he would rarely use when he was hosting strangers. Then, as he used to say, he would also add in a spoon of lentils to make it a formal meal. He would eat maybe a tomato or some greens which he took from his small garden. When I stayed with him, he told me every couple of days: “Go eat in one of the monasteries and come back afterwards.” He only kept tea and dried bread: nothing else. I can say that as much as we eat in a meal, he used to eat in two weeks. He was truly a fleshless man, an earthly angel and a heavenly person. Not only did he not eat anything, but he hardly slept at all. As a monk, of course, he exactingly abided by the schedule of the daily services: the evening, compline, midnight office, matins and the hours. Later on, he substituted most of the services with the prayer rope. He would keep vigil every night. He took a little rest after sunset and even less before sunrise. And I used to see that too, when I would go. I will tell you an experience I had personally because it testifies to this person’s sanctity. When, in 1977, I joined him and remained with him for several days, it happened to be the feast of the Holy Cross. It was September 13 on the old calendar and he said to me: “We will perform a vigil tonight and in the morning a priest will come to perform the service.” I was a deacon then. Indeed, I stayed there and from approximately four in the afternoon he said for us to perform the evening vesper saying the prayer (i.e. the Jesus Prayer) using the prayer rope. Indeed we prayed for one and half to two hours using the prayer rope. At six o’clock he called for me, made me a tea, showed me how to perform the vigil with the prayer rope and told me that around 1:30 a.m. he would call me to read the preparation prayers for Holy Communion, and after that we would continue up until morning when the priest would arrive. Indeed, I tried to do everything he told me. All night I heard the Elder praying and walking back and forth and sighing. It was an amazing experience, because in that desert I was scared, but the Elder was like an unshakable pillar and prayed close by. We went to the church. The chapel was long and narrow, and there were five icons on its iconostasis but only one bench inside. He let me stay on the bench, the Elder by my side and we started reading the preparation service for Holy Communion. The Elder said the phrases “Glory to Thee our God, glory to Thee”, and afterwards in the troparia (hymns) to the Mother of God “Most Holy Mother of God save us”. Every time he said a phrase he did a prostration. And I, close by holding the candle, watched and read the troparion. When we reached the troparion that says, “Mary, Mother of God, the venerable tabernacle of sweet fragrance”, and the Elder said “Most Holy Mother of God save us”, in an way expressing intense distress, then I was just about to say “Mary, Mother of God”. Immediately though, everything altered―I cannot comprehend what happened. Suddenly, the whole cell lit up, and something like a light breeze entered the chapel and the oil lamp of the Mother of God started to move on its own. There were five oil lamps on the iconostasis, but only this oil lamp was moving continuously. I turned towards the elder, and he nodded to stay quiet. He bent down, and remained bent and I remained holding the candle in my hand, but the candle was not necessary because everything was lit up; there was abundant light, as if it had suddenly dawned. I waited for quite some time. The oil lamp was still moving. The light remained, and the Elder was silent. Half an hour later I started reading on my own, since the Elder did not speak. I read the service on my own, until I reached the seventh prayer of Saint Simeon. There like that, again in a very heartening way, the oil lamp stopped moving. The light disappeared, and I needed the candle once again to read. When we finished preparation prayers for Holy Communion, I said to him, “Elder, what was that?” He replied, “What?” I said, “The incident in Church. I saw the Panagia’s** oil lamp moving and the cell was lit up.” He says: “Did you see anything else?” I replied that I did not see anything else. I wanted to tell you that at that time my mind stopped working, and I was unable to think. I couldn’t understand anything. I only watched all this as a spectator. He said: “My son, what was it! Don’t you know that the Panagia, here on Mount Athos, goes around all the monasteries, to all the cells, to see what we’re doing. She passed by this way, saw two loonies here and moved the oil lamp to let us know She passed by.” And the Elder laughed. After that occurrence that night, he told me of many incidents from his life―he was very moved―and maybe that was the reason we then developed a close relationship with the Elder. He trusted me with a lot of things concerning himself. I am truly convinced that Father Paisios was a man that provided support for the world through his prayers. He was a man equally worthy as the great fathers of our Church. One may talk for hours and days about Father Paisios. The miracles that took place through his prayers are probably countless. I will tell you about something that took place towards the end [of the elder’s] life. A father who had a small child wandered around all Mount Athos to find the monk that saved his son from death. One night, the small child was riding a bicycle, and attempting to turn somewhere, was hit by a truck. The truck was going to mash the child with its wheels, when a monk appeared, grabbed him, threw him to the pavement, and in this way the child was saved. The child saw the monk, but did not know who it was. 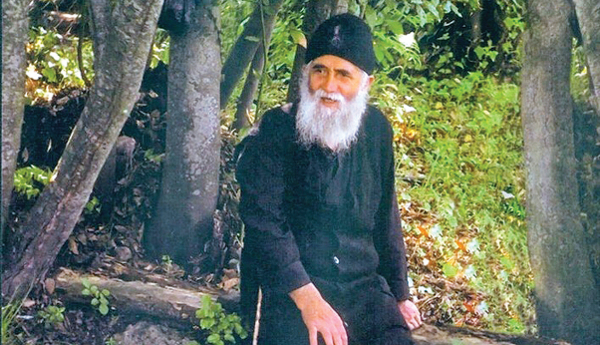 He told his father what happened and the father brought his child to Mount Athos and went around all the cells and monasteries to find the monk, until they arrived to Father Paisios whom the child immediately recognized. Also, another incident took place before I left Cyprus. A young man visited the Elder and wanted to tell him that his wife was very sick. The Elder had received a lot of people and was very tired and said to them: “Children, I cannot, leave and go to Iviron.” The young man said: “I want to tell you something.” The Elder replied: “Go my son, go. Go.” “But I have something important to tell you Elder!” “Go my son, there is nothing wrong. Go and God will help.” He insisted but the Elder told him: “My son, go make it in time for the Monastery, before it shuts”. Then the young man revealed the reason: “Elder, my wife is sick!” “Go. Your wife is fine”. The young man looked at his watch, to see how long he still had to head to the Monastery; it was 2:45 p.m. He left disappointed because he did not achieve anything. When he returned home, his wife, completely recovered told him the following: “Suddenly as I was seated in my bed, I felt a cold sweat, and from then on I was cured. I went to the doctor who said I was completely fine.” He asked her, “What time did this happen?” “It was Friday at 2:45 p.m.” That is, the time the Elder told him: “Go. Your wife is fine”. There are numerous such incidents that we can talk about. But the most important thing is not the Elder’s miracles, but his great love for God, his deep faith and the fact that he was a true child of the Orthodox Church and of monasticism. I think that no matter what anyone may say, they will not be able to describe the Elder. He always said: “Let us love God and strive in magnanimity”. He said that Christ is oxygen. Let us not turn it into carbon dioxide. And that is why he always wanted all Christians to be courageous, full of joy for God’s love and never be disappointed, because, as he always said, anxiety and disappointment are always from the devil and never from God. *Trans. Note: On Mount Athos (and in many monasteries, in general) the term “world” refers to the world outside of Mount Athos (or the monastery). **Trans. Note: “Panagia” is the most common title used for the Mother of God in Orthodox Christianity. It means All-Holy.